A quaint community just outside of Downtown Brevard. Cadence Point is located just one mile outside of historic downtown Brevard, NC. This small and friendly community is full of beautifully designed homes. It offers up that quaint and classic neighborhood feeling. It's the kind of place where you can cross paths and catch up with your neighbors along the built-in sidewalks or out in the open green spaces. You can easily walk or bike across the community and to the many accessible amenities that downtown Brevard has to offer. 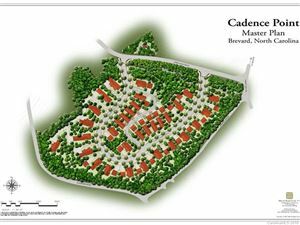 This community creates a peaceful setting between nature and civilization. From Downtown Brevard head southwest on S Broad Street toward Rosman Highway, turn right onto US-64 W (Rosman Highway), just after the bowling alley turn left onto Forrest Hill Road, turn right onto Forest Hill Circle, and lastly turn left onto Cadence Circle. See main entrance.